I am no expert by any means, but i am an ok modeler, and have been a proud owner of Carrara for quite some time. 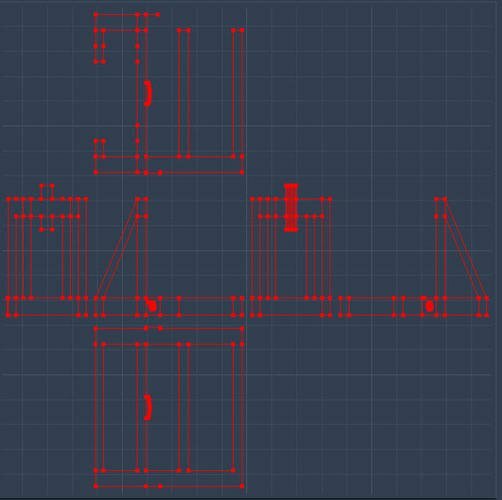 This process is not allowing me to add the detail I want to particualr sections of a model. where the model is UVunwraped and then painted (adding specific details to areas as needed) then loaded back onto the model. 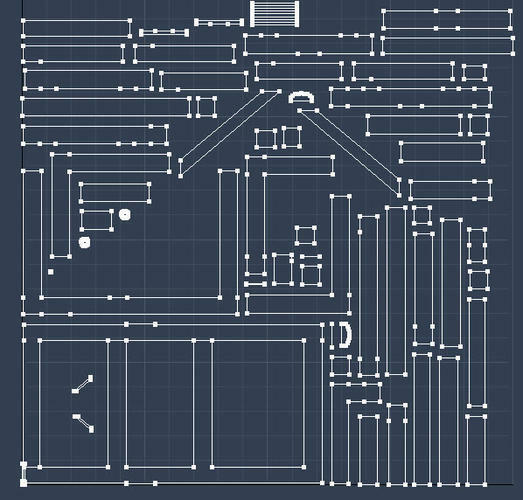 When I try and map something in Carrara all I get is a huge mess of lines and unable to distinguish any portion of the model. I tried pins seams.. etc.. I just do not know what I am doing.. when you have a tiny low poly model perhaps this is do-able.. and easy to identify the pieces.. but on a bigger model I am not having success. What work flow are people using to acomplish this in carrara? Do I need to select the individual shading domains and then uvmap them and detach them etc? I have played around and it seems when I move a vertex or anything on the UV it totally skews and streaches the texture on the model. I am lost.. and not sure how to get this Unwrap to happen, and export, and then paint and reimport to apply to the model to give it the details I need. If I can't figure this out I am going to have to move to an application like MAX, where i know it can be acomplished. imagine how much better it would be if i could get in there and truly add the details at a micro level instead of just a generic flat map wraping around a general shading domain... I want to take my modeling/texturing to the next level.. but don't know how. I have been working on this for a while and can't come up with a process that works.. and reaching out the the community. I am giving it one more try.. before I give up on this. Hello Method321. 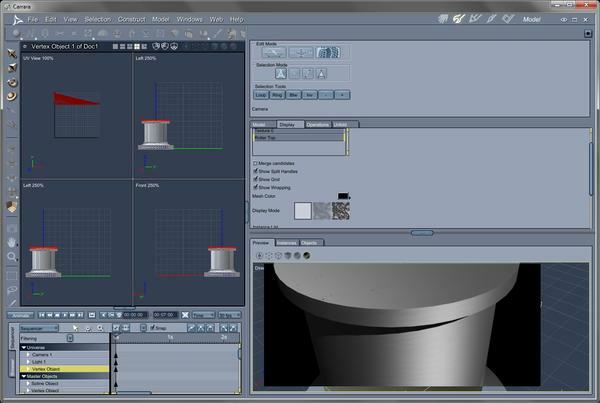 The UV Unwrapping tools in Carrara, although sufficient, are not as "easy going" as some other tools that are out there. In particular I refer to ZBrush and the UV Master tools it provides. Traditional UV Unwrapping is a full on skill set. Getting good results is a time consuming process that requires a great deal of finesse and patience unless "specialized" tools are employed. Before you go down the path of MAX and spend an awful lot of money consider going a different route. By using the GoZ plugin for Carrara you can painlessly transfer your work back n forth between the applications. UV Unwrapping and micro detailing can all be handled with ease inside ZBrush and transferred back to Carrara with a single click. That's the workflow that I prefer to use ;) Oh yeah, and ZBrush is waaaaay cheaper than Max! I looked ad the Interface for Zbrush... wow is that confusing, but may need to take another look. what about UVmapper pro or Untimate Unwrap? are those tool of value? i played with a demo and still would not seem to get what i wanted out of it.. I heard that Zbrush has some kicking UV abilities but that UI was intimidating and never tried to pursue it. I really don't want to leave Carrara, i like its interface and its workflow moving from room-to-room as you work on your model, unlike MAX or Maya where you have 9000 gizmos all piled on tops of you. Sure i know you can customize shelves etc to get a trimmed back UI, or turn geometry invisible in the view etc.. but Carrars rooms is something i have grown to adopt and really like how it work. I may need to revisit the Zbrush side of things.. was hoping it would be easier then that.. and not have involve a complex secondary app... but it sounds like If i want to stick with Carrara that may be my only option. Will see what else folks may offer in this thread over the next few days. There's a lot of folks on here that have experience with UV Mapper Pro but I haven't personally used it. The ZBrush interface can be intimidating at first but it's really great after getting over the initial hump. What finally got me over the hesitation about jumping into ZBrush a few years ago was the fact it's rather ubiquitous in the industry. Regardless of what software is the mainstay in a shop's pipeline it's a pretty safe bet ZBrush is in the mix. So time spent learning ZBrush is not wasted. It directly translates to something of value when applying to studios and agencies (but of course, the work in one's folio speaks louder than text on a resume). By using GoZ you're not having to abandon Carrara. Just think of ZBrush as a super plug in for all your UV, detailing and texturing needs. Throw in the advances in base mesh construction and retopology tools and ZBrush is a must (imho)! a. 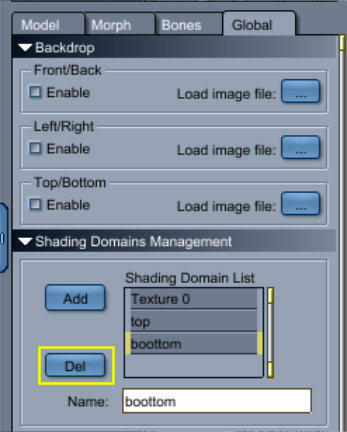 Go to the "Display Tab" of the UV, then uncheck 'show all' - just your shading domain will show up. b. You can give that shading its own UV map if you wish and export that for painting. I'll try to attach some images later to give examples, but need to mark them up first. Okay, here is a basic cube with some hints on display mode and checking textures for UVMaps. 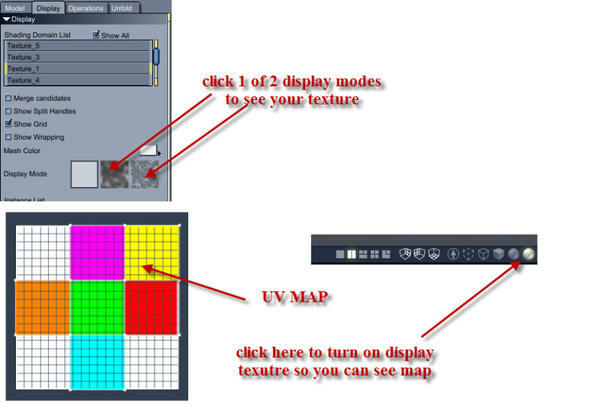 The images are from the bottom up, shows how you can turn on the display mode in the UV room to check texture. This is important if you use Carrara to rotate UV maps or UV maps of Shading Domains so they align and encompass your texture map. 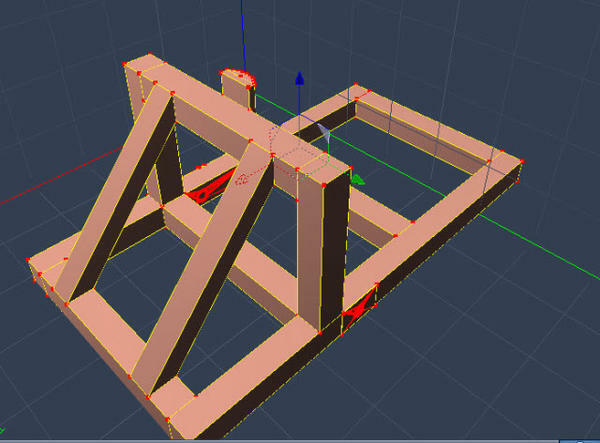 Okay, found a catapult on Google Models and am using that. 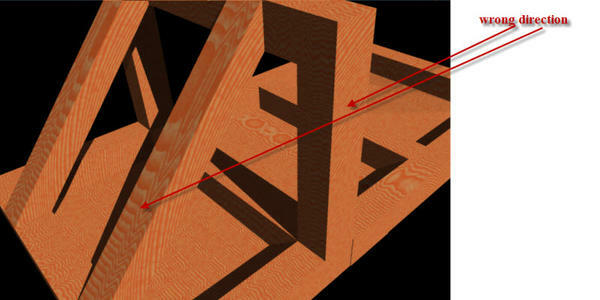 Note: you will have to untriangulate and fix coplanar errors in the model room. 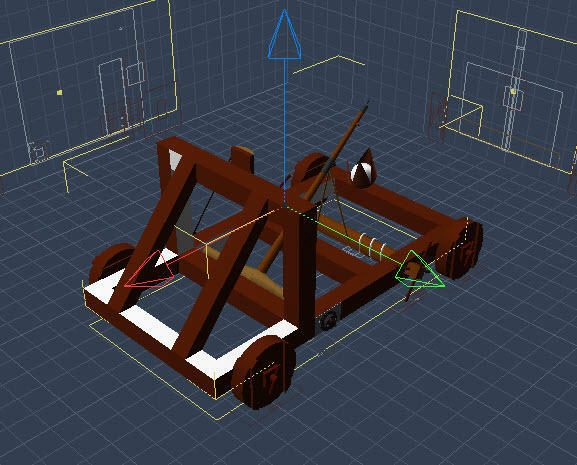 The first image is what the catapult looks like in the UV room. 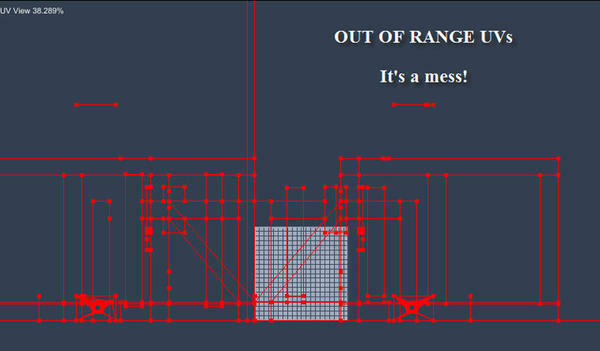 It's a mess as every thing is out of range (goes past 0 and 1 coordinates and well, it's a mess. Remember what I wrote about making your model in parts and making shading domains? This is important even if you use a dedicated UV mapper , like the UVMAPPER STandard or Pro. The first image is the UV MAPPER Standard or Classic map of just the sled part with no shading domains and the object imported back into Carrara with the new UV map. But, back to making shading domains from parts and sub-shading domains from smaller parts. Do you see the problems? 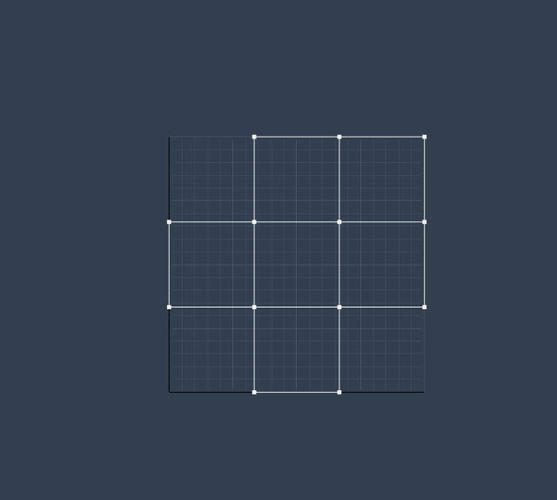 All those small parts (rounded ones) crossing over the rectangular UVs, making it very confusing to texture. Here's a standard wood texture on the model. Please note how the wood grain is in all different directions. Note: This could be corrected by rotating shading domain parts in the UV window or if you paint externally, rotating the 'grain' of the texture until it matches the UV map. Remember under selections in the model room, you can select shading domains under "Select By" even with the UV window open. This will save you some time if you named them beforehand. Even with a good map like what UV Mapper classic made, there is still work to be done. Pinning and making seams are used to flatten out uvmaps so they behave how you want. Knowing where they go is a bit like sewing a pattern (can get complicated) and imo is the least desirable way to do it, but if the model is not split up by shading domain or parts, it may be the only way to go. Finally, here's a display that shows the 'sled' portion of the catapult and perhaps how I would split it up into parts and/or shading domains. It makes life much simpler when you need to texture. The sled map broken down into parts for easier texturing. Some parts can be laid on top of each other if, in this case, the wood grain is running in the same direction. 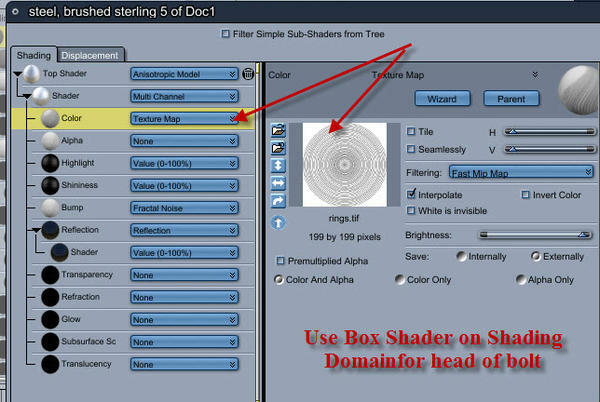 Other parts or subdomains (shader domains) may need to be rotated or painted externally. If you're having difficuly figuring anything out,. ....start by simplifying it. Start with a simple object,. then by adding seams, and unwrapping, you can see more easily what's going on. 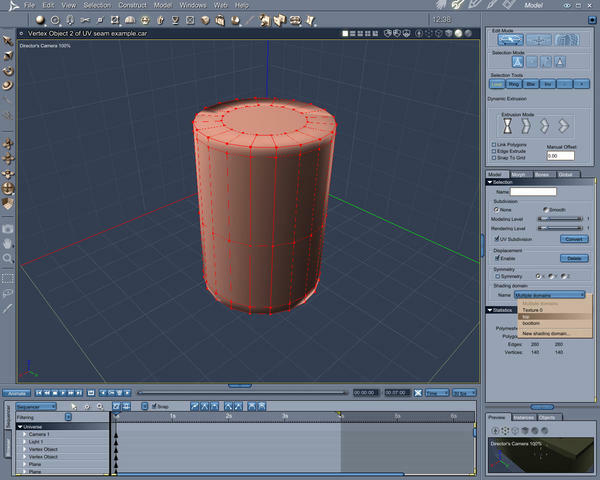 In this example, i've made a simple vertex cylinder from a circle, extruded. I've then selected the top and bottom loop's, and a vertical edge,.. Why? ..
Because the top and botom are both already flat,. 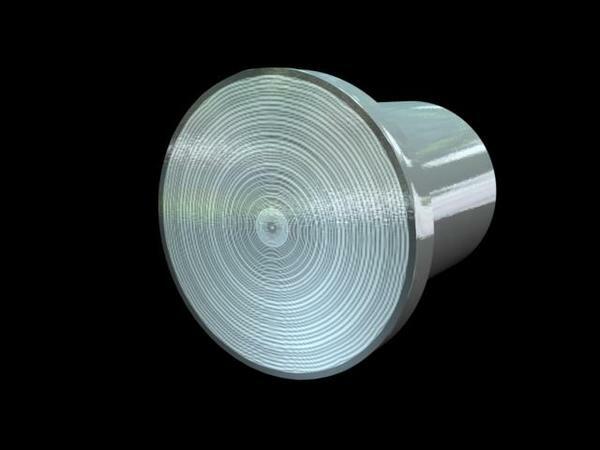 and the vertical edge allows the cylinder to be split at that point,.. and flattened in the UV grid. Once I have created those seams,. I can unwrap,. then Move and Scale those separate sections within the UV grid. Once i'm happy with that layout,. I can go to the "display" tab,. 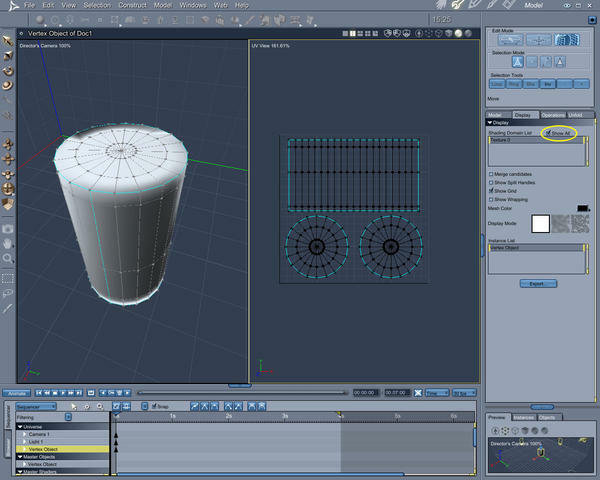 and export a UV template,. which I can use as a guide for creating a texture map in an image editor like Photoshop. Or,... I can use the 3D Paint tools directly in Carrara, to create texture maps. so i have one question.. if i make a shading domain, and later i want to delete.. how do i do that? i can't seem to find a way to remove it. I realize i can just ignore it and not use it, but what i found is that if you import into unity (at least once the .car has been exported to .fbx) the model will display all the shading domains, so if there are unnecessary ones listed that can get confusing) I know how to delete shaders, and of course that is not in the texturing room where you create them.. but i wasn't seeing Shading Domains in that same area to delete unnecessary ones. i worked on several test models last night and it looks like i will be able to break my models apart and build the UVmaps I need all within Carrara. The only remaining piece to the puzzle is how to delete an unneeded shading-domain. Shading domains are simply a defined selection of polygons,. So,.. 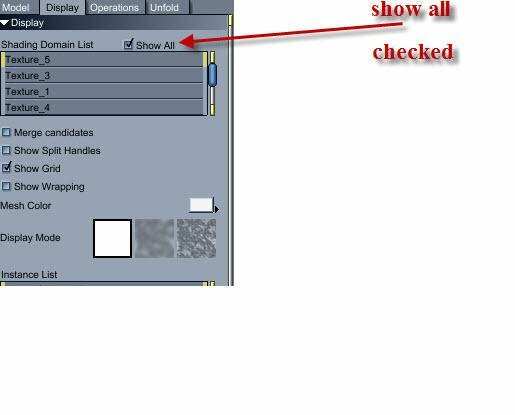 If your object has (for example) two shading domains, "top" and "bottom",. then you decide you only need the "top" domain,. you can select the polygons associated with the "Bottom" shading domain,. and then change the shading domain those polygons are associated with. 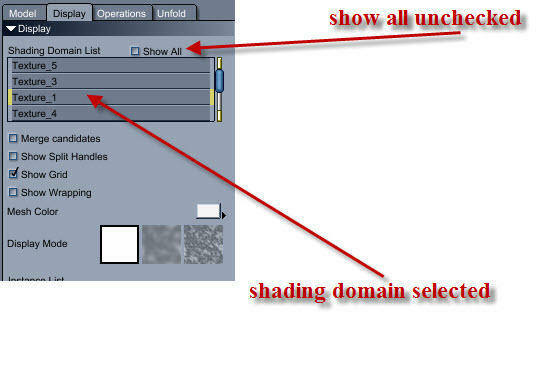 or you could select the entire object, then select the shading domain those are associated with. To remove unwanted shaders from the list, you can select and delete them from the "Global" tab, in the modeller. I couldn't help but jump in on this thread as this seems very close to something I've been struggling with. on my own so I am very much a newbie with UV mapping. My project involves a number of brushed metal machined rollers. The Carrara included shaders work great. The only problem I have is I can't seem to get the circular brushed pattern at the top of the cylinder. The sides look great. 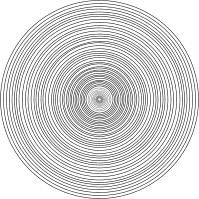 I've created a separate shading domain in the vertex modeler so I can alter the top of the cylinder , but no matter what I do I just seem to see specks rather the a circular swirl. I've tried to alter this in the shading room and haven't found the correct answer so I'm guessing I need to alter the uv map to achieve this effect? Not sure if this is the look you wanted, but gave it a quick spin. I used the brushed shader supplied with Carrara. Made a shader domain for the flat head portion of the bolt I made. Used a HDRI map to render. Thanks for the reply. I'll give it a shot. and thank you for the PNG.